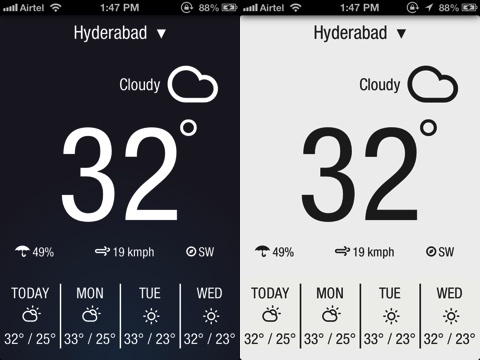 Are you looking for a weather iOS app with basic information and a clean interface? The Weather Neue iPhone app is an excellent free option to get weather details without superfluous content and multiple gesture controls. The Weather Neue iPhone app requires location services activation to function properly. You approve the location services authorization in one touch through a pop-up notification. Instantly, the details of your location’s weather appear on the screen. The interface is extremely simple and clear. The location name is at the top of the screen with a description of the weather, like “Mostly Cloudy,” just under it. Visually, the largest content is the temperature. It fills the middle of the screen. Three smaller icons with the humidity, wind speed, and wind direction give you that information as well. Finally, the bottom of the screen has the daily and extended forecast including the high and low temperatures and icons to indicate the weather’s description for the next three days. That’s it. You shake the phone to update the weather details. The only settings adjustments in the Weather Neue iPhone app change the units of measure and the theme. There are four rich, sophisticated color schemes. I particularly liked the scorched theme with its striking, bold orange background. To change between metric and standard measure, you use responsive, one-touch gesture controls. The Weather Neue iPhone app is extremely successful with its concise, well-organized interface and sharp graphic presence. 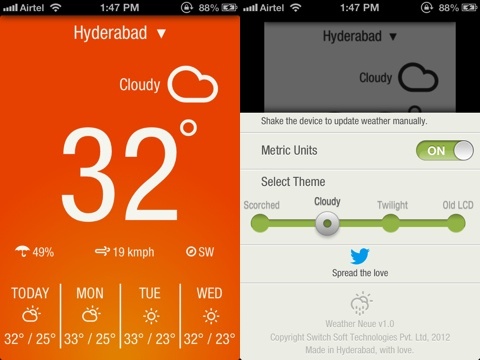 AppSafari review of Weather Neue was written by Jenni Ward on July 11th, 2012 and categorized under App Store, Free, Productivity, Travel, Weather. Page viewed 4775 times, 1 so far today. Need help on using these apps? Please read the Help Page.